My knowledge of eighteenth century fashion is not as extensive as my knowledge of nineteenth century fashion but I am still learning. This dress appears to have come from the later part of the century after the stomacher and panniers had largely gone out of fashion. The material appears to be silk for both the gown and the petticoat. There are delicate pink roses scattered over the fabric, giving the appearance of nature in a time when getting back to the natural way of living was becoming fashionable once more. Three-quarter length sleeves were common and fashionable as well. 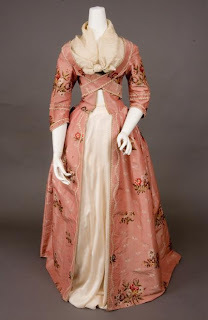 What makes this dress interesting to me is the crisscrossed strips of pink silk over the bodice, under the neck kerchief. There are several differences between the way women dressed in the eighteenth century as opposed to the nineteenth century, although they may look quite similar to the untrained eye. Women of the nineteenth century would rather die than have their petticoats exposed, for example. It would be like you walking around in public in your underwear. In the eighteenth century, however, the petticoat was considered an important part of the ensemble. It was worn under the gown, as you see above, and was not thought of as part of the underclothing. Another marked difference in fashion between the two centuries was the use of stays rather than corsets. A corset, used in the nineteenth century, was the foundation piece to a woman’s look and it was designed to give her a highly desirable hourglass shape. Women of the previous century wore stays, which were shaped like hard undershirts and were designed to push up the bust, give upright posture and give the illusion of the waist being narrow by coming to a point. Another difference between shapes of the different centuries was the use of panniers versus hoops. Panniers were worn in the eighteenth century and designed to give the hips a wide, square appearance. By the last decades of the century, however, panniers were given up by the majority of women in favor of a more natural silhouette (except those at royal courts). The natural silhouette lasted through the first few decades of the nineteenth century until more and more petticoats were needed to give the fullness the skirts required for fashion. In the 1850s, a cage crinoline was used to eliminate some of the petticoat weight and give the huge bell shape. >Now this is more my style! 😉 It was actually Marie Antoinette who brought this simpler fashion into play. When things started heating up politically in the latter two decades in France, and complaints of the outrageous opulance of the French court were rampant, the Queen of France decided that she needed to simplify and make the appearance of being less extravagant. She adopted and made popular the less formal "country peasant" look in ladies' fashion. Sleeves became simpler, the stomacher went out, and paniers were traded in for bustle-like crescent-shaped pads. This look was the pre-cursor to the late 1790's-Early 19th century Empire style. >Jessica, the crisscrossed strips of silk below the neck handkerchief are in reality the robings of the gown. They are supposed to be pinned straight down on each side of a stomacher since the gown does not close completely in front. I'm going to guess that this gown is a little earlier than we might think, and may have been altered in the 1780s. 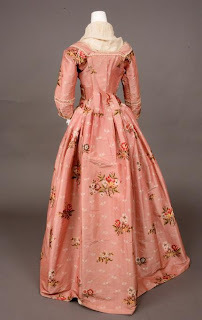 The embroidered silk and the style of the gown looks to me like 1750s or 1760s…maybe early 1770s. The length of the sleeve seems a bit later, but material could have been added to the sleeves to update it. I don't know for certain, just my educated guess.